This is a bit of a blast from the past, I originally created many elements of this post back in 2010 and early 2011, so bear with me – I’ve been busy. Before Nokia’s partnership with Microsoft and their foray into Windows Mobile phones, there was uncertainty in the public that Nokia could follow-up their previous successes in the smartphone business with the onslaught from both the touch-friendly Apple iPhone and even BlackBerry’s constant deluge of hardware with minor tweaks. This was also around the same time that Palm (later acquired by HP) hit the ground running with the Pre2. Nokia’s answer at the time was the N8, and later the E7 for the business crowd [and then the E63… E72… E73 Mode… E71X… and even later still the E6 (which I’ve yet to post a proper review of), All skeletons of the amazing E71 – WHICH I STILL USE AND LOVE!]. 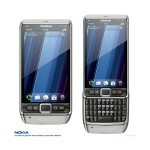 Neither were truly satisfactory answers, although they both had the unmistakable solid-built Nokia look and feel. It was around this time that I thought it would be a good idea to ‘flesh out’ my dream phone – at least via the computer. The result was a hybrid of the Nokia N8 with the physical buttons and a vertical slideout QWERTY backlit keyboard from the Nokia E71, running WebOS. At the time I still had plenty of hope for WebOS as it seemed to be a very easy platform for developers to get pump out quality apps for. Combined with Nokia’s expertise developing the multi-tasking Symbian OS it seemed like a lot of good features from both OSes could be ‘married’ in such a partnership. Alas, it wasn’t meant to be. I had fun making the mockups in Fireworks – to the right is the high-resolution “Ad” for my make-believe E81, for others who are dreamers, or perhaps for someone out there that is listening and will grant my weird wish for a proper vertical QWERTY slider. And no – the BlackBerry Torch and non-existent Palm/HP Pre3 aren’t “proper”. You can safely stop scrolling now.